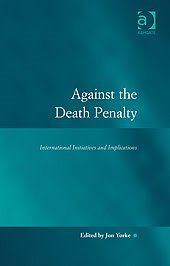 Jon Yorke of the University of Surrey has just published Against the Death Penalty, International Initiatives and Implications, with Ashgate. This edited collection includes essays on developments within the United Nations, the Council of Europe, the African Commission and the Commonwealth Caribbean, engaging with the emergence of regional norms promoting collective restriction and renunciation of the punishment. Contributions investigate perspectives and questions for retentionist countries, focusing on the United States, China, Korea and Taiwan, and reveal the iniquities of contemporary capital judicial systems. Emphasis is placed on the issues of transparency of municipal jurisdictions, the jurisprudence on the ‘death row and the changing nature of public opinion. The volume surveys and critiques the arguments used to scrutinize the death penalty to then offer a detailed analysis of possible replacement sanctions.